Stamp Kissing. Are you familiar with it? Basically, you ink up one stamp, then ink up another, press the two together and then stamp one of the two onto your paper to get a sort of combined image. It's fun. No...really...it is. And...the best part is the really neat designs that can come out of this wicked cool technique! I have a new post up over on the Gourmet Rubber Stamps Blog showing off this very technique! First of all, did you know that the Gourmet Rubber Stamps Coveralls are PERFECT for 6x6 cards?! I love that about them! I used two coverall background stamps for this card, the Thanks Squared is the fabulous subway art style thank you. I love that I can cut each of these out to use individually, too, if I'd like! I also used the fabulous Chevron Stripes! 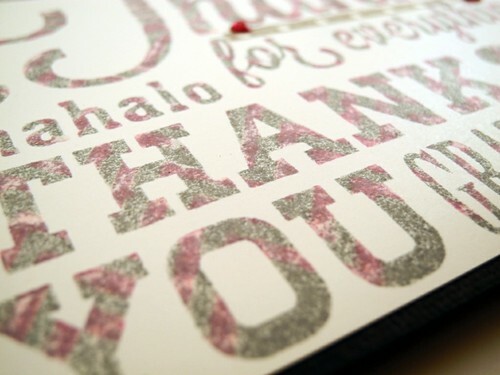 I stamped the Thanks Squared image in London Fog (Momento) ink and then pressed the Chevron Stripes stamp into a bright pink Hero Arts ink. I kissed the two together and then stamped the Thanks Squared onto my white paper being sure to apply even pressure to get a clean image. I love the texture the zig zag adds without making the already full image too busy! I embellished with just a small strip of washi tape and a few sparkly bits to give it a little extra and matted it on a black card base. I had SO MUCH FUN creating this card! It was one of those..."hmmmm....I wonder if this will work" kind of moments that actually DID work! YAY for those!!!! I hope you have a super fabulous Tuesday!!!! no I havn't tried that but I will~looks very interesting!!! Fun card Jingle!!!! Love this technique! Your card came out great! I love the two colors of the chevron showing on the stamped image. Great card and love your technique! I haven't used it but once, so thanks for the inspiration! Great stamps, too!! You chickie..will never cease to amaze me. Love this technique. Great stamp and a lovely, subtle design to the lettering. Great technique. Beautiful stamping! Love the chevron look in the lettering! Very cool, and yes the lines are perfectly subtle! !.........but in all seriousness, I LOVE THE NUTS in your previous card, beyond cute!! So fabulous! I love how this looks! Great effect from the chevrons on this wonderful thank you card! What's more, it sounds like it made you happy, yay! What a cool card, and I love the colors you've used.